My parents always stressed that the best godparents are family members. Friends come and go, but family is a constant. They’re forever there for you. So why did they pick friends to be my godparents? Never knew them. Never saw them. So I adopted Cynthia’s godparents as my own. Our aunt and uncle in Puerto Rico, whom we affectionately named, Madrinita, little godmother, and Panino, apparently we couldn’t pronounce godfather, Padrino. The nerve-center of our family was our grandparents house, where Panino lived until he married and where Madrinita still lives today. Panino bought a house down the street from them and is, also, still there. My grandparent’s house is old, with cool, thick walls, incredibly high ceilings, typically Spanish styled. Panino’s room was across from my grandfather’s, and we weren’t allowed in his room unless he was there and he issued the “okay”. Those were the rules. Panino was the uncle who would come home late from the University, he was in graduate school, and in a loud voice ask my mother, who would be on the second floor, front balcony, with my grandparents, aunts and any visiting uncle, “Oye! Y donde estan las nenas?”, “Hey! Where are the girls?”. All the rocking chairs would freeze mid-rock as my mother would try to explain that as four and six-year olds, we had long been in bed and was he aware of how late it was? He would hear none of it! Under hissed threats that he better not wake us, he’d happily sail into our bedroom, throw on the light and loudly wake us up. “Nenas! Nenas! Depiertate! Quien quiere helado de coco? Vamonos! Vamonos! A Los Chinitos!”. “Girls! Girls! Wake up! Who wants coconut sherbet? Let’s go! Let’s go! To The Chinitos!” You can only imagine my mother’s futile protestations falling on Panino’s deaf bachelor ears. And, so, at eleven o’clock at night, off we’d go in our nightgowns and tennis shoes to get ice cream. He was that special uncle who took us everywhere. My aunts would all laugh and say, “Don’t ever go off with Panino! He’ll hold you hostage in his car all day and you’ll never get home!” That was just fine by us. Countless times he took Cynthia and me up into the mountains that were only a beautiful, foggy haze from the balcony at home. We would spend the whole day just exploring, exotic territory to us. The trip home was never a let-down because during the treacherous ride down the mountain’s snake-like roads with hairpin turns, Panino would open the moon roof of his Peugeot, and driving as fast as he possibly could, would let his nieces at four and six little years old, STAND UP IN THE CAR, TORSOS HANGING OUT THE MOON ROOF, ARMS UP IN THE AIR, screaming in sheer delight with reckless abandon! Oh, yeah. That was Panino. A cool uncle. He’s quite the holistic, yoga-loving being and evolved into a vegetarian, eschewing meat with outrage, sometimes to the point of alienating his siblings. Years later he “kidnapped” Pamela and me, along with our babies, James and Catherine. We stopped and picked up a gallon of milk for the little ones and, loaded with diapers, bottles and no car seats, off we went to the mountains. What a beautiful time! We meandered through picturesque, colonial towns, the babies dozing or having their bottles. When it was time to refill the bottles one of us would hold the gallon of milk, the other the baby bottle, all the while trying to hold on to our babies. If you can visualize that, then you can imagine the amount of milk that splashed and spilled all over the back floor of his car. We didn’t say anything partly because we didn’t want to get in trouble and partly because we knew Panino didn’t want to hear about it. Our final stop before the trip back home was to stop at one of the many road-side stands for some Roast Pork, whole pig on a spit. It was delicious. Tender and intense with the flavors of garlic and oregano, we gorged ourselves. Panino would have none, none!, but smiled, indulgently remembering the addicting song of the pork-siren. For dessert we ate big, mega-crisp shards of the roasted pig skin, cuerito. It’s one of the few times in life when it would be a bona fide sin to even entertain the thought of how incredibly unhealthful this stuff is. We made our way back home, tired and sticky, the fullness of the day exhausting us. Kissing Panino goodbye, we thanked him for the day and struggled into the house with Jamesy and Catherine in our arms, trying to keep hold of all our baby accoutrement. The following day we ran into Panino’s wife, Lucy, and after the requisite kisses and pleasantries, we excitedly asked her about the boxed roasted pig and fried pig skin Panino had taken home to her. “What pig?”, she asked, “What are you talking about?” “The pig, the roasted pig Panino brought you. With the big piece of cuero on top? Did you like it? Wasn’t it so good?” Panino, the meat-free, tofu touting, vegetarian had eaten all of it on the two-block drive from our grandparent’s house to his house! Then Lucy asked, “By the way, do you girls know what’s on the floor of his car? In the backseat? It just smells awful! Did the babies get sick?” “Gosh, we don’t know..” and “No, no. We left it just the way we found it. We have no idea”, we chorused. Right. Pamela and I ran upstairs and just fell on the floor laughing, imagining the sour, rank smell of the milk left overnight in a 118° closed-up car. We screamed thinking of the milk becoming rancid, clumpy curds. And fetid, sour globs of cheese. We just howled. “Gosh, we don’t know…” We still laugh. And we love Panino all the more for it! 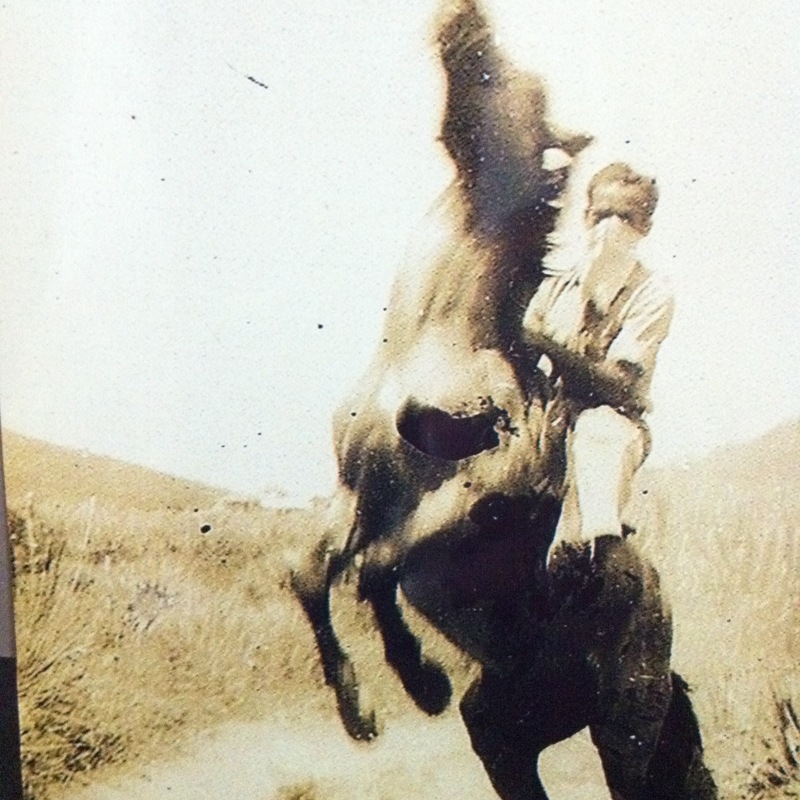 Panino, at 17, playing Zorro. All the boys had their own horses. As all nice girls, Mama and my aunts, her sisters, were relegated to the house to read, write poetry or do needlework. Oh, wait! I forgot they had china dolls to play with, too. Doesn’t THAT make everything better? Mix well. Holding the skinny end of the bone and beginning at the widest pat of the fat cap, use a sharp knife and make one continuous cut between the fat layer and the meat until you have one huge flap of fat all the way back to the beginning of the skinny bone end. Flip the fat over the skinny bone so the meat is exposed. With a small knife make 1″ deep incisions all over the meat, that way the marinade will work its way into the meat and further flavor it. Sprinkle salt all over the inside of the fat, but just the fat, not the meat. 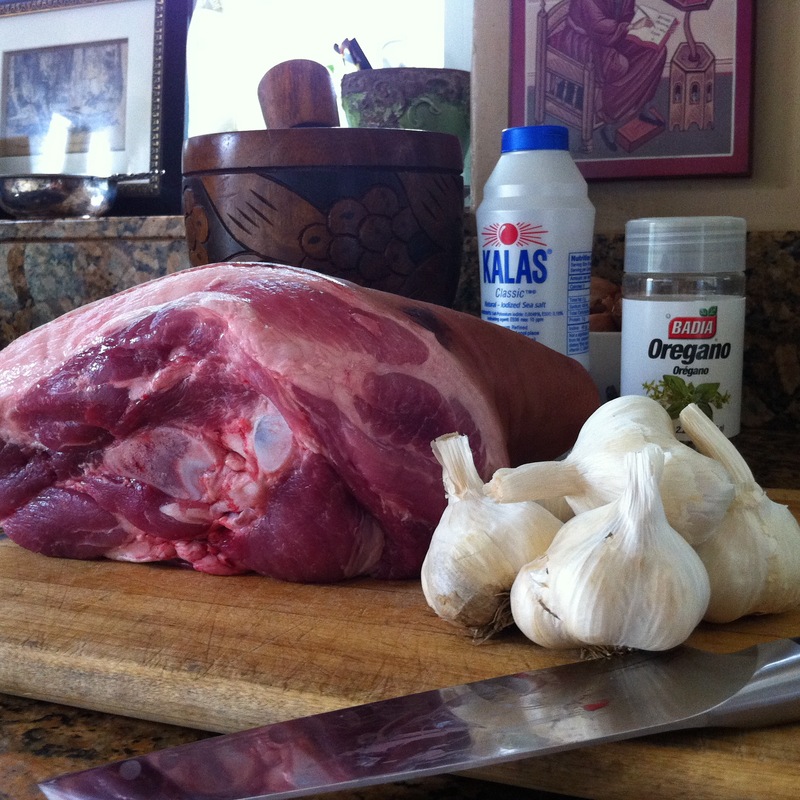 Using your hands, spread and rub the marinade all over the meat, sides, bottom and especially where the fat was cut. Fold the fat layer back over the meat, sprinkle with salt, cover and refrigerate for 24 hours. The meat needs to cook for 5 or 6 hours and to come to room temperature before roasting or it will steam. Bleh. It won’t crisp up and will cook to a gray shade. So, take the meat out of the refrigerator for at least one hour before putting in the oven. Preheat the oven to 400° and back to the meat. It needs to roast in a deep pan because there will be a lot of grease. Put the meat fat side up in the pan, you will never turn the meat. Once more, fat side up for some outrageous cueritos, and at no point will you cover it. Place the meat into the 400° oven for one hour and then drop the temperature to 300° for the rest of the cooking time. When the meat shreds easily with a fork it is done. If the cuero is not crispy enough for you, take the meat out of the oven, raise the temperature back to 400°, and put back into the oven when the temperature has been reached for 15-20 minutes or until it’s crispy. Remove from oven and let the meat rest uncovered for at least 30 minutes before carving. Take the cuero off and scrape off any uncooked fat that might be left. While the meat rests, break the cuero into pieces and enjoy with your guests. It’s really good with cocktails or beer. Scrape any fat off the meat, carve and serve. If you take this dish to a party don’t cover or box up the cuero or it’ll turn into mushy, nasty fat. Buen provecho. And Boricua love. If you add lemon juice to this recipe does it make it Greek? You had a charmed childhood! Continue to savor the memories for many years to come.